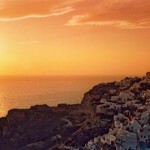 Santorini is the most Southern of the Cyclades islands. It has a surface area of 75 square kilometers and a population of about 12,000. One side of the island is just the rest of a volcanic Caldera and the otherside is full of fertile valleys producing wine (the famous Santorini Wine) and tomato crop. There are no lakes, rivers or many wells; water is being imported or converted from seawater through the use of de-salination plants. The locals live mainly of fishing, agriculture and tourism, while the island’s largest export product is soil, used all over the world, mainly to make building material. 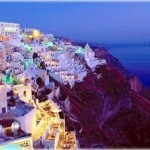 Santorini is with no doubts one of the most magical and romantic islands in Greece. It’s volcano, or rather remnants of it, is the outstanding tourist attraction which draws thousands to the island. The volcano is still active, and the last eruption was in the 50s, causing an earthquake that destroyed many villages on the island. The central part of the ancient volcano sank into the sea causing the surfacing of Santorini itself and the small neighbouring islands of Thirassia, Palea and Nea Kameni. The impressive Caldera dominates the west part of the island while the marvellous dry climate and the almost continuous sunshine create year-around conditions which are perfect for observation, photographs and videos of the world-famous Santorini Sunset. The main town, Fira has a population of about 3,000 people. In recent years Santorini has a brand new airport handling jet aircraft arriving and departing most mainland European airports with direct service. Ships arrive at the deep harbour and then have to take a bus that drives you along the steep ascent into town. While the old port of Santorini created as a result of the volcano eruption makes you scale hundreds of steps via donkey or foot to get to the main town, which is built overhead, but for those with lazy disposition, there is a cable car available. As soon as you arrive downtown, you are greeted with a very nice town with a stunning view of the Caldera, seen from the top, with beautiful white washed houses and many churches. In the town of Fira is also the Museum, which contains artifacts from the past and present. 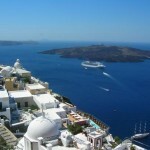 Also you’ll find lots of shops, tavernas and restaurants, clubs, cafè and Santorini car rental agencies. The Eastern side slowly descents to the sea where you can find the beaches of Kamari and Monolithos; while southward there are the beaches of Perissa and Perivolos; Baxedes, Ammoudi and Koloumbos beaches can be reached going northward.